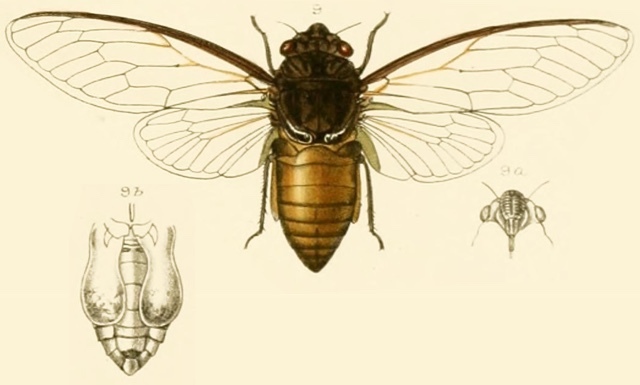 Cryptotympana aquila is a cicada found in Indonesia, Malaysia, Brunei, Thailand, and likely adjacent nations. This description comes from A Monograph of Oriental Cicadas by W. L. Distant. 1889-1892. Read it on the Biodiversity Heritage Library website. Male: Body above black; eyes ochraceous; ocelli luteous. Pronotum with some indistinct discal markings and the posterior margin pale castaneous. Mesonotum with a central triangular linear fascia, on each side of which is an irregular and inwardly notched fascia, and the basal cruciform elevation, pale castaneous. Abdomen black, the lateral margins fringed with pale castaneous pile. Body beneath very pale castaneous; the face, anterior margin of the head between face and eyes, and basal abdominal patch, black. Anterior legs black, the femera streaked with pale castaneous; intermediate legs with the femora black streaked with pale castaneous, the tibis pale castaneous with their bases and apices black; posterior legs pale castaneous, the bases and apices of femora and tibiae black. Tegmina and wing pale hyaline; tegmina with the venation and the costal membrane pale castaneous, the extreme basal margin of the last black; the basal third (excluding venation) and the subcostal area to apex, blackish; wings with about basal half obliquely black. The body is robust but moderately elongate; the opercula do not overlap at their basal margins, and at a short distance from base become widely divergent and narrowed to apices, their outer margins slightly concavely sinuate and in length, they extend a little beyond the middle of the abdomen. Long. excl. tegm. Male, 40 to 45 millim. Exp. tegm. 115 to 120 millim. Dundubia rufivena rufivena Walker, 1850 is a cicada from the island of Borneo (Indonesia, Malaysia and Brunei). Dundubia rufivena rufivena was also once known as Dundubia mellea. [male] Head, pronotum and mesonotum brownish-ochraceous, ocelli pale ochraceous, eyes pale castaneous; front with some obscure black lateral striae; mesonotum with two short faint central obconical spots, and a larger obconical spot on each lateral area; base of cruciform elevation dark castaneous; abdomen above and beneath and the opercula golden-yellow, margins of the opercula more or less shaded with black; head beneath, sternum and legs dull ochraceous, tibiae and tarsi pale castaneous. Tegmina and wings pale hyaline, the first with the costal membrane and basal portion of the venation bright ochraceous, remaining venation darker; wings with the venation ochraceous, in some portions, infuscated. The rostrum extends to about the intermediate coxae; the opercula are somewhat short, concave on each side near base and rounded at apices, which about reach the base of the fifth abdominal segment; anterior femora and posterior tibiae spined.